An unusual genealogy project has evolved out of my work with the Traveling Summer Republic for the exhibit, Utopia – Revisiting a German State in America: the Giessen Emigration Society Descendants Project. As my own family research which started over 50 years ago was reignited in the early 70s with my own discovery of Duden and Missouri’s emigration societies, this project is very personal. While I did not have ancestors that were members, I find their story shares the story of Missouri’s German emigrants so well, that it truly fascinates me. 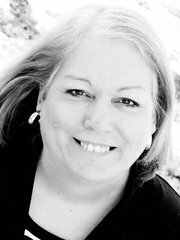 It has helped me understand what my own ancestors had to have experienced. 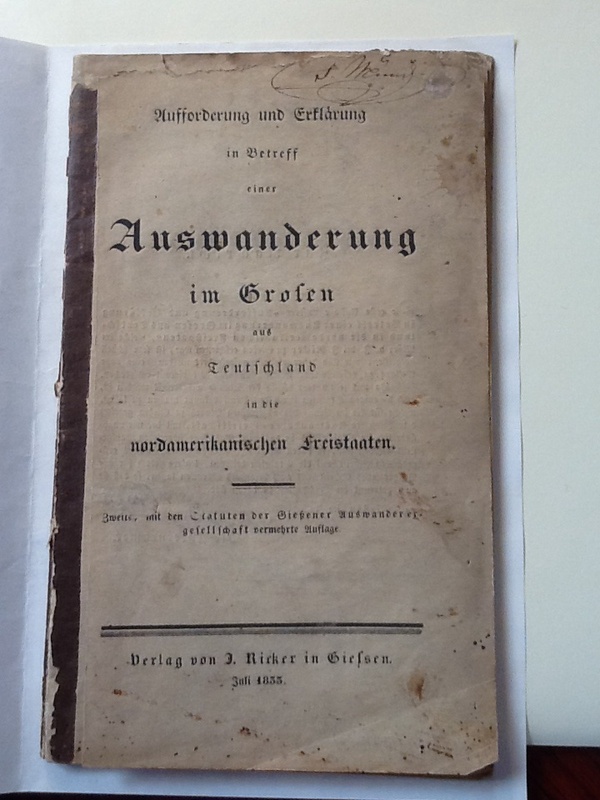 Aufforderung und Erklärung in Betreff einer Auswanderung im Großen aus Teutschland in die Nordamerikanishen Freistaaten or “Call and declaration of the subject of mass emigration from Germany to the North American free states” in the spring of 1833, and then made their selections from the “thousands” of applicants who read their publication to join them, these comprise the Society. No membership list has ever been located by historians. 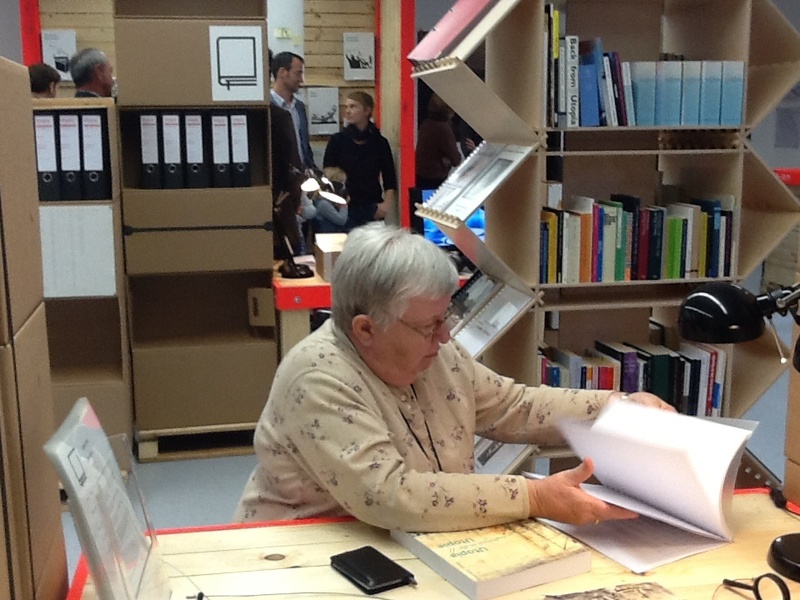 For further verification, there are books, letters home, newspaper accounts, diaries, journals, and account books that further confirm many of its members. The groups selected ranged in age from newborn to mid-80s, were from many different villages, towns and cities, all over Germany. They were of every occupation and trade necessary to make a strong start on a new German “capitol” or center for future emigrants to join. They were also all religions, from Catholic, Lutheran, Protestant, Free Thinker and Jew. The groups were generally all middle class, and all united in one purpose, freedom and democracy. 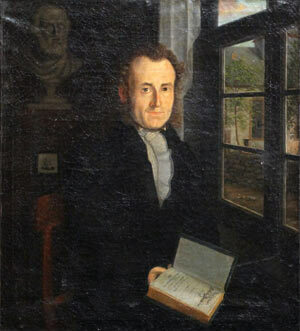 biography of Friedrich Muench, I reached out to several members of the family. As the family is quite large and far flung, I learned the same thing is true in most families. 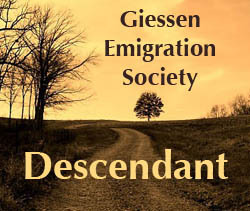 Taking the principle farther I wondered what more could we learn about the Giessen Emigration Society, if we had pieces of the puzzle, from all 500 plus families! So began my Giessen Emigration Society project. An even more amazing reward emerged when I found that the project also enabled cousins to reunite with cousins all over the world. As descendants of immigrants in the early 19th century were generally of the fourth, fifth and sixth generation since arrival, it is surprising how many already know that their ancestor was a member. I have had families in Germany hire a translator and ask “my family had members that went to the U.S. and I wonder where they are?” and help reunite the German and American cousins once again. At programs for descendants I have called out an emigrants name, and watched as two cousins, unbeknownst before that moment, raised their hands. Reunited, often finding that documents and photographs never known to exist, were in the other family’s loving care. Social media is also helping! With our own page on facebook: https://www.facebook.com/groups/GiessenSociety/ the group is growing. As some people like to remain anonymous though, I do maintain a private list that I do not share and then work to keep everyone informed of the progress by email. My goal is to create a digital online museum of every family that will share the entire legacy of the society, and their impact on Missouri’s history. And while not all of them ever made it all the way to Missouri, their pioneer spirit and quest for American democracy lives on in all of their descendants. If you believe your family descends from a member of the Giessen Emigration Society, or you have questions, please contact me through the form below.